Nicole tagged me the other day for the Middle Name Game. I'm kind of an eye roller when it comes to games but because Nicole is so nice I'm going to do it. The pickings for stuff to blog about is pretty thin around here, it's hot and all I really want to do is complain about it. A- Attitude... most of you know, I always have one..good or bad. R- Ridiculous... which I often am. E- Eye roll... I do that A LOT. So who to tag.. have you been naughty or nice? Elizabeth, Sandy, Tammy, Tracy and Brenda. And on another note, Holly's planning a big event, so stay tuned! You know with her, it's all about the food! I somehow managed to not notice the new window for a week or so. Can you believe that? I come in through the side door but yesterday we had some activity in the parking lot and we went out the front door to investigate. 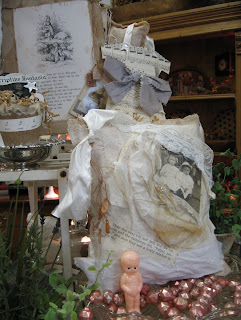 Leslie has done it again, another wonderful window display. I wish my sewing room was as pretty as the one in the window! It's a scorcher here in Super-Sunny-Northern California. And a Spare-the-Air day. Time to turn off unnecessary electrics and ride out the weather. Hope you all keep cool my fine feathered friends! Yesterday I worked all day with Tina. It was a busy/slow day, you know spurts of busy followed by slow, where we worked on kits and rolled fat quarters. Tina and our friend Carol, who dropped in to say HI and pick up some fabric, worked on this quilt. Looks yummy doesn't it? Can't wait to see it Tina! Friday night Sandy, Elizabeth and I went over to American Harvest for a wonderful Holiday celebration. 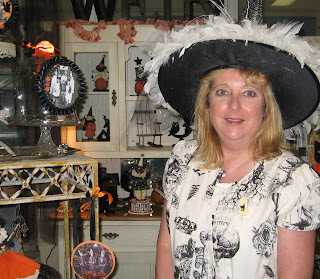 The shop was decorated in all its Fall Finery. My shortcomings as a photographer are becoming more evident as each event passes. 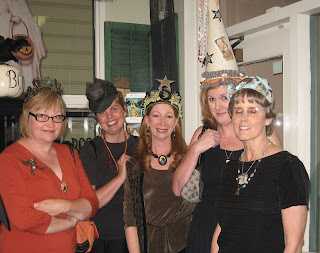 Here are some familiar faces to many of you, Lucille, Ulla, Sharon, Elizabeth and Sandy. Sorry sorry Sandy I didn't get a better photo of you! Here's Ingrid Pomeroy with some of her work. Here's another shot of the lovely Lucille. I was super excited to meet her, we have a mutual friend in common, Angelina. I can never believe what a small world it is. She 'got' who I was right away but sadly, I am very slow on the uptake. Now some photos of the shop. It was a divine evening. The weather was perfect and the town packed with people dining out, strolling the sidewalks, attending the outdoor concert in the park. 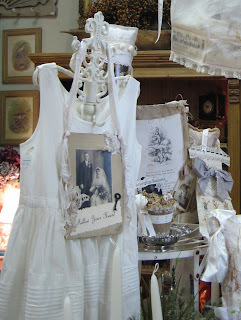 Here's some other corners of the shop, not fall but still lovely. I believe this is the work of Lauren Mumford. It was wonderful to be invited to this event. The food and drink flowed and it was a magical evening. Thanks to Elizabeth and Sandy for going with me and Sharon and Roger for inviting me! pst! There are photos of the event here, here and here. Oh my lovely friends, I certainly didn't expect that outpouring of wonderful comments. One would think I didn't post just to garner more compliments...which by the way, I did not! You are all way way to kind. So thank you thank you! It has been a busy week. As you know, if you read my blog, I'm a lazy lazy person, and when I have something to do EVERY SINGLE DAY OF THE WEEK I just feel, well, BUSY. The activities don't even have to take up the whole day. It's clearly true for me, the less you have to do the longer it takes. 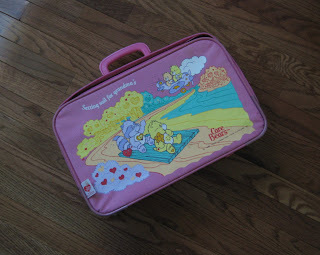 Back in the olden days when I went (by covered wagon) to my job as a systems engineer (computer nerd) I managed to get craploads of stuff done. So yeah, its Friday night and I am beat. And weirdly up late. Anyway, here's something that made me all thrilled this week. Another new visitor to the yard. I'm a big backyard bird person and this is a photo of one of the two new arrivals. 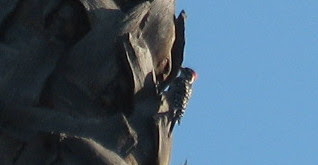 That's my woodpecker on my ugly palm tree. I was so surprised to see him tap tap tapping, since it sounded like the blue jay who likes to tap on the gutters to wake us up. Anyway, haven't seen him since. Our other new bird is a Black Phoebe. He's pretty and so far I don't have a photo. He migrates through I think, I only see him a couple of times a year, but he's the cutest. So lovely people.. have a good weekend. 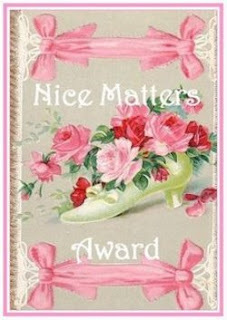 That Silly Lil' Doe nominated me for a Nice Matters Award and I can't tell you how sweet that is, since Doe is so darn nice. 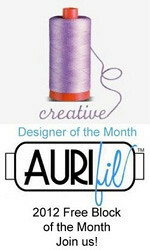 I like to head over to her blog for a good read and inspiration on new projects. She's always making something that inspires me. So thanks Doe. You're the greatest. I don't know how I'd manage to choose people since everyone I read is so nice. Some I just read, some people I actually interact with, and some people I know in real life. They're all so wonderful. So many on my blogroll and then even more over in Bloglines. 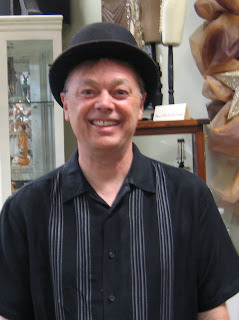 I'm not so nice in that I don't keep my blogroll up-to-date with my bloglines. I want to thank each and every one of you for what you bring to my daily life. I love reading your blogs, being inspired, entertained, sharing your joys and sorrows. And thanks to all the people who read and never comment.. I know you're out there! And thanks to the people who come by the shop or the booth to say hi! Thanks to every one. I'd give you all a big hug if I could! Oh, have a super day all my sweet friends. I'll see you later! 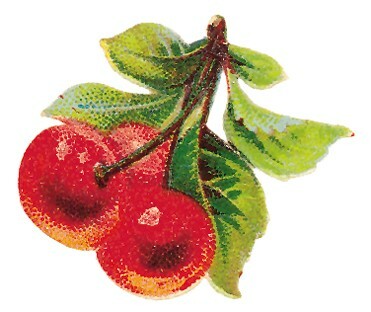 Good morning my bloggy friends. Hope this Monday morning finds you well and ready to hit the day running! I know how busy everyone gets when its back-to-school time. I can feel fall in the air and the light in the evening has that certain quality I always associate with the beginning of school. 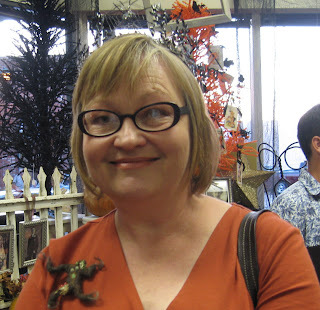 And speaking of beginning things, my friend Tammy has finally got her blog up and running. She's a delight and I hope you get a chance to go over and say hi! She's vending at the big quilt show in Nashville this week, so I'd love her to have some welcoming comments to come home to. And just because its always nice to have a photo to look at, here's a picture of the feature wall at the shop. Tina has made this darling quilt from a Quilt Soup Pattern named Summer Cottage. She's done a lovely job. I think she's teaching a class on it this schedule, and maybe there's even some kits, I'm not sure. Well that's all for today my dears, hope it's a good one! 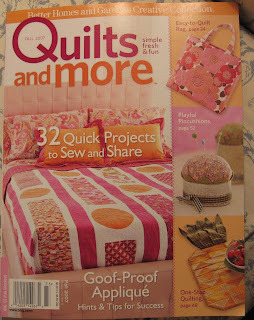 I was having a quiet evening watching tv and reading my Quilts and More when I recognized a familiar name. 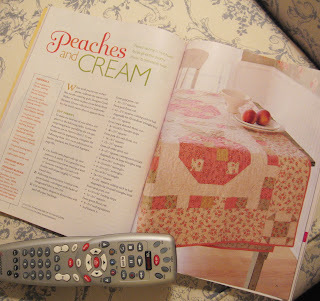 Congratulations on your Peaches and Cream Quilt Cyndi! 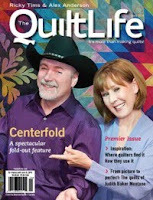 When I opened this magazine at the shop to flip through it one of the first things I saw was this quilt and I told Melissa, hey, this is pretty cute... and decided to get the magazine for sure. 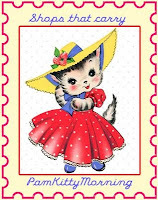 Not only is this cute, but there are several other things I love like that pin cushion on the cover. I can't help it, I just feel so happy when I see a familiar project or name. I'm super lucky to know a lot of talented people! The answer is NO. They could not. What a couple of really nice nice people. Sharon and Dennis. And Dennis seems like the model husband, and believe me, I know model husbands! I can't tell you how much fun it was. I know if we all lived close we'd be lunching and shopping. And I have to say Sharon looked a little familiar to me. I'm still thinking about that. Could we have met before? She did live nearby and I have worked in one quilt shop or another for over 10 years now! Just look at that bag full of goodies she has there! I'm sure she'll be showing off that bag and hopefully that carload of Daiso they must have. I'm a little pea green about that and need to work in a trip there real soon. REAL SOON. It was a super time. I am so happy to have met them. I wish they didn't live a million miles away! It was great Sharon, I hope you had a nice safe trip home. See you next year, same time? Ohhh boy, today is going to be a big day, we're having visitor's to In Between Stitches! 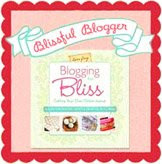 Blogging celebrity Sharon of Red Geranium Cottage will be here! She and her husband are on a romantic weekend in Napa, and are swinging through town to drop in. I am charging my camera battery right now, getting ready for the bloggy photo fest you know we'll be having. Sharon is gal pals with a lot of bloggy celebrities.. like the lovely and talented Doe. There's no way I'll measure up to that... lets hope Sharon can overlook how ridiculous I can be and doesn't ask any hard questions about, for instance, Steam-a-Seam. Nicole was very kind about that whole crazy business, braved a SaS purchase and was quite successful in spite of my pitiful explanation. I think its going to be an exciting day! I'll fill you all in later! So what was your favorite book as a kid? Mine was Harriet the Spy. Oh how I loved that book. I have read it countless times, as well as its sequels The Long Secret and Sport. I was an avid reader as a kid. Mom would take us to the library once a week during the summer and I was only allowed 12 books by mom mandate, a kid should spend some time playing. Of course I also read Nancy Drew. I own a few copies, none give me more pleasure than the anniversary series of books on tape read by Laura Linney. I have listened to them many times. The cultural differences alone from the 30's are worth the read. By the time I was in 5th grade I'd chewed though all the children's books in the library and headed into the young adult area and on into adult fiction. Mysteries, lawyer stories, spy books, all my favorites. Probably a lot of stuff I just didn't understand but I loved to read. Now I just like cozy mysteries, like Agatha Raisin and Miss Zukas, and a host of others too numerous to mention. And don't get me started on Perry Mason,The Man From Uncle, Murder She Wrote, Matlock, CSI..
Who left this little bear nestled in the bushes out front? It was put there during Frankie's visit last week. Hmm, does somebody have a secret admirer? 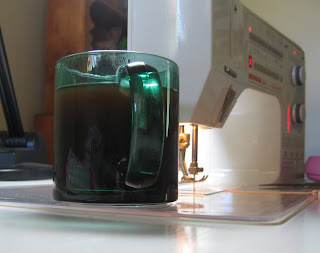 Not to let Holly corner the market on Favorite Things, here's one of my favorites, coffee at the sewing machine. This green cup is the cup Bret always uses when he makes coffee for me. Always. Sometimes I will lounge around in bed if he gets up first just to wait for that first cup on the nightstand. Just one more reason to love that guy! For those who wonder, the sewing table is STILL CLEARED OFF. I know, its a shocker! I'm a huge pile-er of objects but somehow I've managed to keep it clean! I notice a couple of things trying to creep there way on... I mean really, I'm not a miracle worker, but so far so good. I can't say the same for the ironing board. There's more stuff piled on there than ever before. And its probably no surprise the pretty cover is still in the package. Things are still shuffling around here, so who knows what the future holds! Hope you all have a weekend filled with your favorite things my friends!!! What did you do today? I was just doodling around the house for the most part. 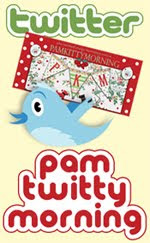 Talked to my pal Tammy Tadd and her Webmaster Laura this morning. Pretty soon Tammy will have a blog up and running. 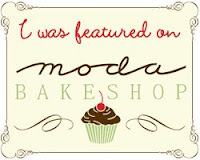 I'm looking forward to seeing her at Fall Market and I'm really hoping we're neighbors again. Elizabeth and I have been wanting to go over to see what's new at American Harvest in Pleasanton so I went and picked her up and we headed over to say hi to Sharon and see what was new there. As usual there was a lot to behold. So the rest of the day I just doodled around some more and vacuumed with my new birthday vacuum. (that I did indeed ask for as crazy as it sounds) I love it, but if the Dyson Company was to email me about it, I'd say Dyson people, make this vacuum a little easier to maneuver. I have hardwood or hard surface floors throughout the house. I need a real vacuum that marries the convenience of a stick vac and the brushes of a real vacuum for the large rugs we have. I think this model is sooooo close, but it's killing my arm while I wield it around the hard surface floors. So Dyson. There you have it. You're almost there. And on another note...she's more than gone to Grandma's this time. While she's left before, her room was always there full of her stuff waiting.. this time, not so much. She happily enjoying her apartment. Today Grandma went to visit her! Now it all makes more sense. We are busy bee's around here getting ready for the move. Frankie has taken possession of her apartment, and we've dropped off a load of stuff. Furniture to follow. Soon she'll have her own place of residence. And what do you know, for someone so lackadaisical around here, she wants things just so there. Hmm. Needless to say, it's hard to concentrate with so much going on, and so much out of my own control. You know, when things have to be just so.. I don't interfere. Instead of pictures of chaos I'll offer up these lovelies to show you. Sandy had a lovely little bag of goodies for me last week when we got together. 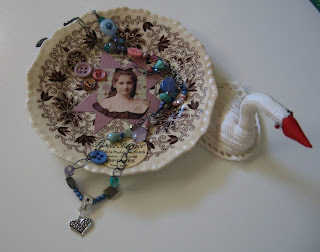 The plate is from her collection of altered plates here. 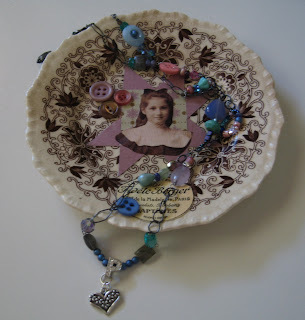 The necklace is a delightful little treat she made and I completely love it! I've been envying her creations for some time now. She's so talented in so many different areas. And, as a bonus, a swan. Which in light of our love of this movie, makes complete sense! Happy days my friends. Happy days!